We have developed a number of specialized tools that can help you learn to draw when used in conjunction with the techniques described in the book and DVD, Drawing on the Right Side of the Brain. Go to our DRSB Store to see the items available for sale. You can purchase the Artist’s Portfolio, illustrated above, which includes everything you need to learn to draw, all of it contained in a handsome and durable DRSB plastic portfolio carrying case. There are two versions available: with or without the 2-hour DRSB video with Betty Edwards herself offering seven lessons with demonstrations and explanations. 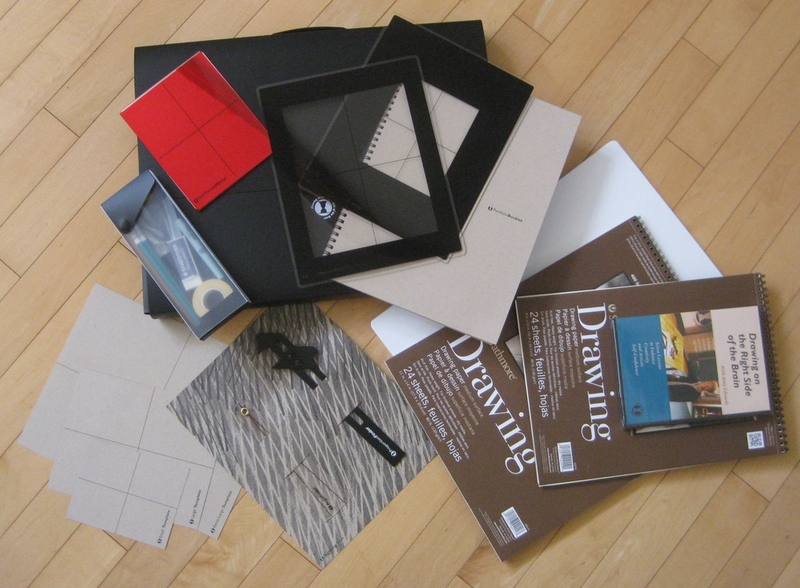 However, you can also purchase the DRSB specialized drawing tools individually, and then assemble the rest of the materials yourself. A drawing board: Buy a drawing board from an art supply store or improvise by using a heavy piece of cardboard, a thin piece of lumber such as Masonite, or even a large wood cutting board as long as it is not too heavy. Drawing paper: We recommend Strathmore 400 Series Regular Surface drawing paper. You will need two sizes of drawing paper pads: 9” x 12 and 11” x 14”. Pencils: You will need drawing pencils (Prismacolor Turquoise 4B and 6B) and a yellow #2 graphite pencil; you can purchase these at an art supply store. Hand-held pencil sharpener, which you can purchase in an art or office supply store. A graphite stick: a 4B black graphite stick, found in an art supply store. A water-soluble marker: You'll need a non-permanent black Vis-à-Vis wet-erasable marker, available in office supply stores. Erasers (2): You will need a Staedtler Mars plastic eraser, and a Generals' kneaded rubber eraser, available in art or office supply stores. Tape: You will need a roll of low-tack masking tape, found in at an art supply store. Please note: The Vase/Faces and Upside-Down Drawings can be found here on the DRSB Website for free download.